After a long hiatus during the housing recession, Boston’s new construction high-rise market is now growing rapidly, and Ice Air is getting into some exciting projects in high-demand neighborhoods with Water Source Heat Pumps. A 365-unit Vertical Stack Water Source Heat Pump job, 88 Exeter Street is currently under construction next door to the Prudential Building in downtown Boston. It will be a mixed use/residential tower in a location that is rapidly becoming a prime neighborhood for young professionals with a modern, high-class aesthetic. The bottom floors of the new building will be home to The Capital Grille and Nordstrom’s, as well as other retail shops. In order to simplify the construction process and save money on labor costs, Ice Air proposed shipping the copper risers for the Vertical Stack WSHPs separately in advance of the heat pump casings. This is extremely beneficial to the contractor and installation process because shipping the risers as a separate package allows Ice Air to send more equipment per shipment, minimizing the amount of deliveries required. Packaging each riser set separately also allows job site handling and installation to be greatly reduced, saving both time and money. While this is not common practice in the industry, “Ice Air’s out-of-the-box thinking is about trying to give contractors another way to do their projects and making it simpler for the contractor,” said Tom Glass, Ice Air’s Director of National Accounts. Once the installing mechanical contractors understood this unique approach to fabricating and shipping the riser packages, they quickly came to appreciate the benefits and cost savings involved and were excited to move forward with the project. Ice Air’s unique plan to ship the riser packages separately was an innovative solution for the construction and installation teams, and represented significant benefits in terms of costs and logistics. 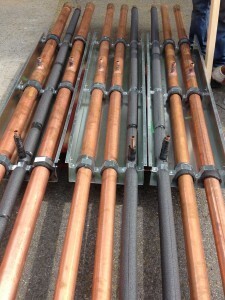 Ice Air shipped copper risers for a Boston job’s Vertical Stack WSHPs separately in advance of the heat pump casings, which minimized the amount of deliveries required and saved time and money for the contractor.